For homeless, abused and abandoned animals, the Fort McMurray SPCA kennels are a welcome haven and a place of hope until they find their forever homes. What your SPONSORSHIP gift means for the animals: A healthy diet, fresh water and soft, warm bedding, Life-saving medical care and a refuge for abused and “special needs” animals and a cozy place to call their own while they wait to be adopted. Ready to make a difference and save lives? Click Buy Now to directly sponsor a safe haven for an animal in need at our shelter. Each purchase represents one kennel. Be a champion for animals in need by signing up for our monthly Paws Plan where your donation of any amount is direct debited monthly. Every dollar counts. 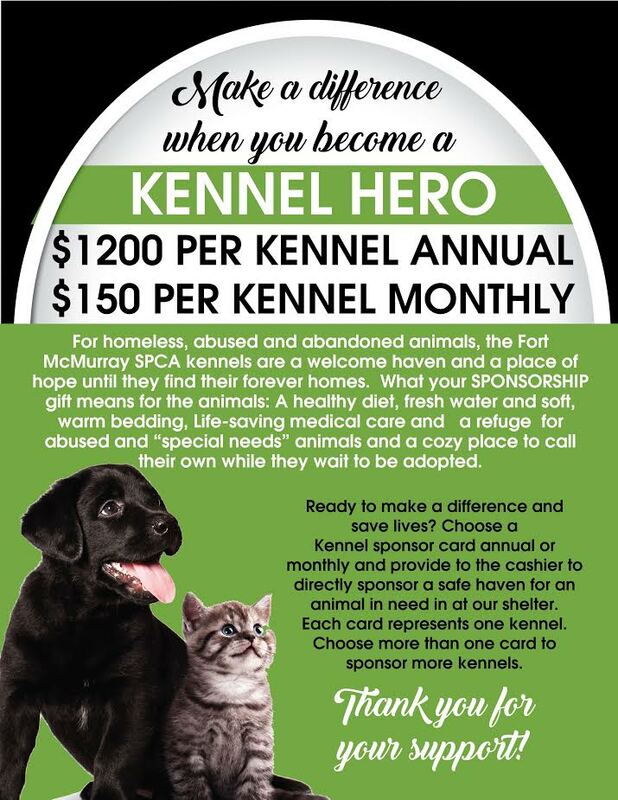 Give the gift that keeps on giving through a monthly donation to help the FMSPCA help animals in need and build a sustainable future. Ready to make a difference and save lives? 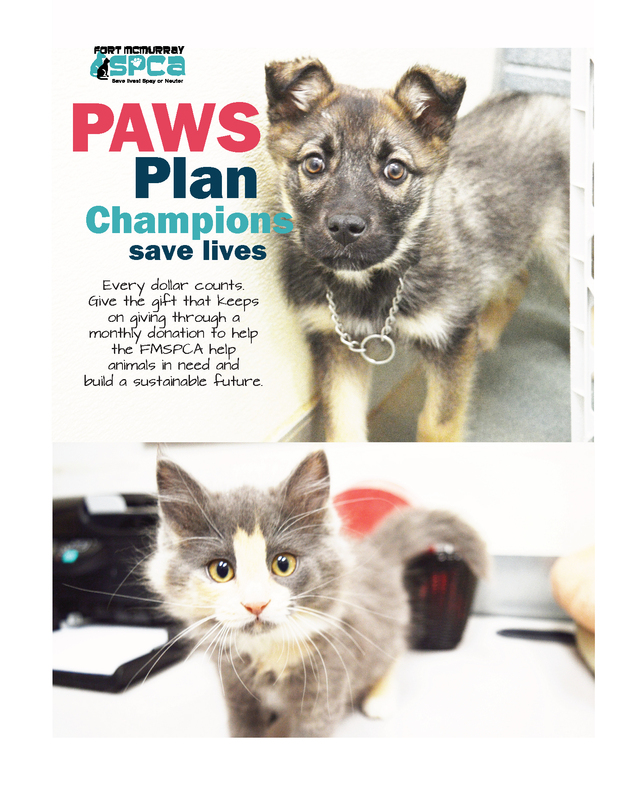 Click Buy Now to become a Paws Plan Champion for animals! Microchips are implantable computer chips that encode a unique identification number to help reunite owners with their lost pet. They are no bigger than a grain of rice and they are placed under a pet’s skin with a needle and syringe, not much differently than a routine vaccine. Unlike collars and ID tags, they can never break or fall-off ensuring vital contact information is only a phone call away for every adopted animal. Ready to make a difference and save lives? 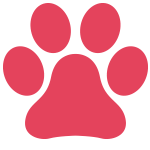 Click Buy Now to purchase important identification for an animal in need in at our shelter. 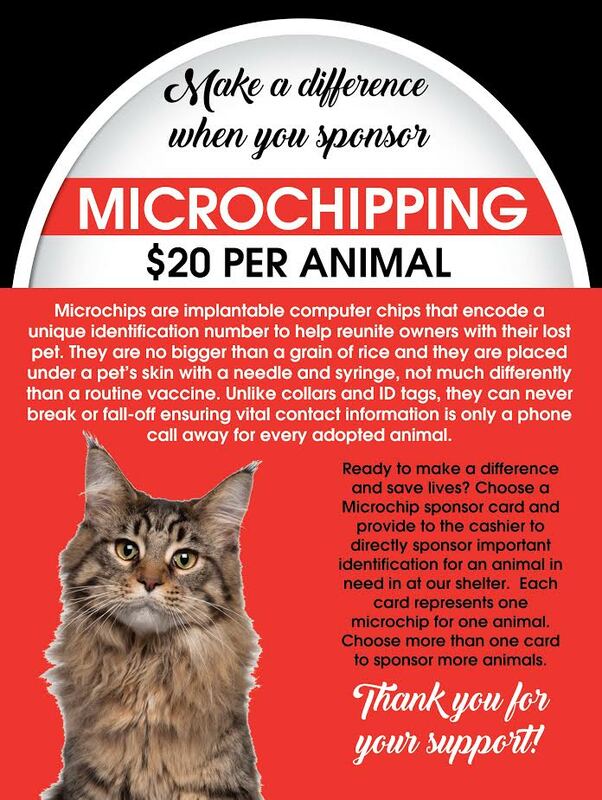 Each purchase represents one microchip for one animal. Choose more than one to sponsor more animals. 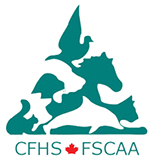 Vaccinations are an important part of a dog or cat’s health care routine. By vaccinating a shelter pet, you help protect our furry friends from various diseases including rabies, distemper, parvovirus, infectious hepatitis, Bordetella,feline leukemia and others prior to their adoption. Ready to make a difference and save lives? 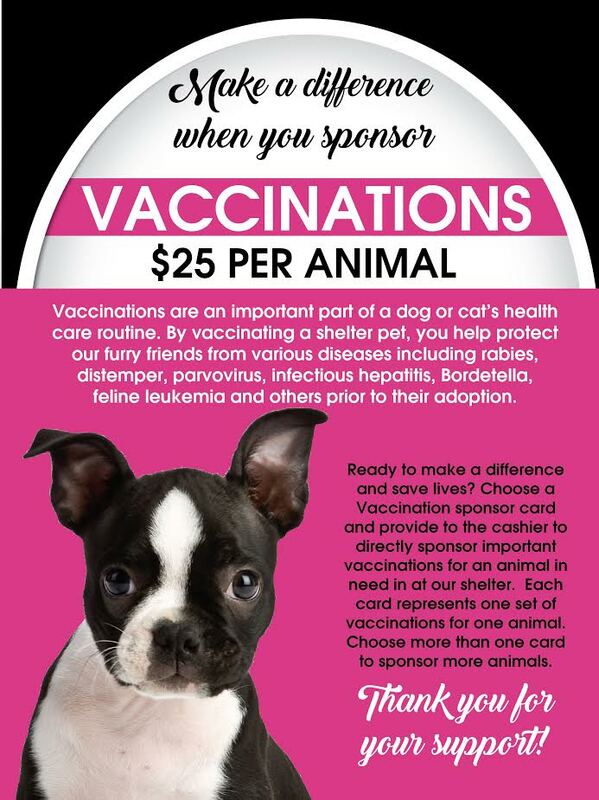 Click Buy Now purchase important vaccinations for an animal in need in at our shelter. Each purchase represents one set of vaccinations for one animal. Choose more than one to sponsor more animals. Ensuring that our feline residents needs are met while awaiting adoption into their forever homes, sufficient supply of fresh, clean litter is vital to helping them maintain their health and good manners when it comes to using the litter box. Becoming part of our ‘litter-atti’ provides essential care to our feline residents. Ready to make a difference and save lives? 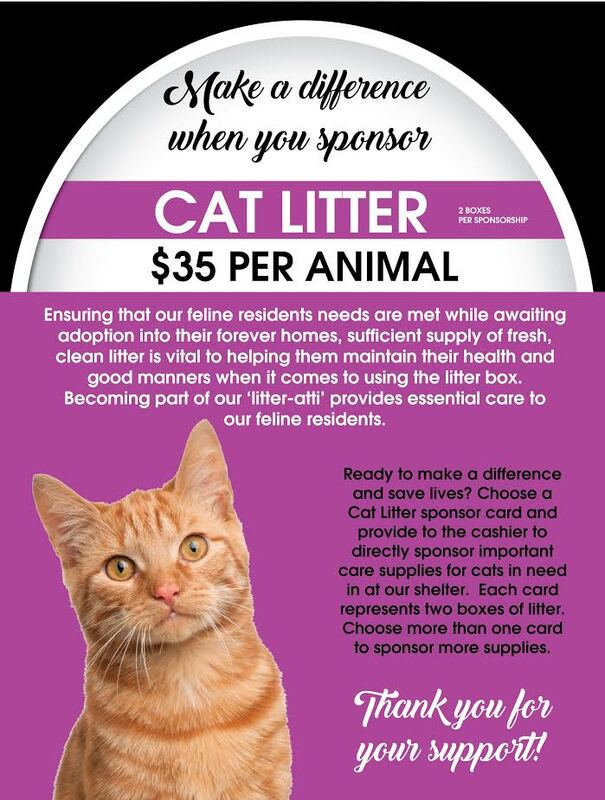 Click Buy Now to purchase important care supplies for cats in need in at our shelter. Each purchase represents two boxes of litter. Choose more than one purchase to sponsor more supplies. 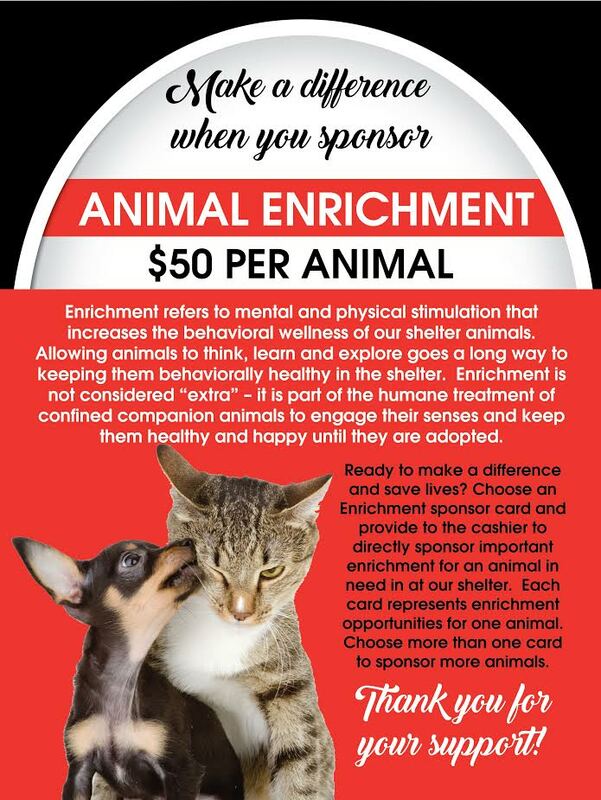 Enrichment refers to mental and physical stimulation that increases the behavioral wellness of our shelter animals. Allowing animals to think, learn and explore goes a long way to keeping them behaviorally healthy in the shelter. Enrichment is not considered “extra” – it is part of the humane treatment of confined companion animals to engage their senses and keep them healthy and happy until they are adopted. Ready to make a difference and save lives? Click Buy Now to purchase this item and directly sponsor important enrichment for an animal in need in at our shelter. Each purchase represents enrichment opportunities for one animal. Choose more than one to sponsor more animals. Spaying and neutering makes a big difference: Just one unaltered female dog and her offspring can produce 67,000 puppies in only six years. In seven years, one female cat and her offspring can produce an incredible 370,000 kittens! Every animal in our care receives this surgery prior to adoption. Ready to make a difference and save lives? Click Buy Now to directly sponsor this surgery for an animal in need at our shelter. 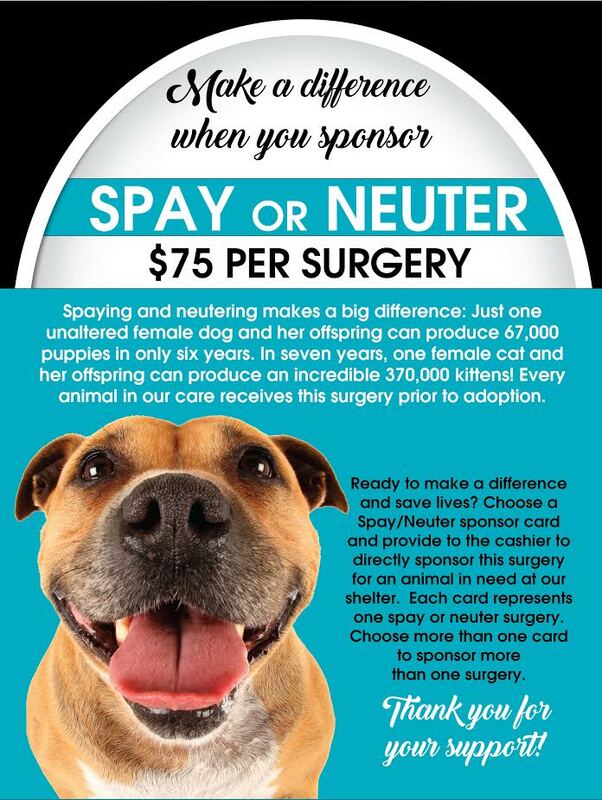 Each purchase represents one spay or neuter surgery. Choose more than one to sponsor more than one surgery. Want to help senior animals that are in our care but cannot take them home? Your sponsorship helps cover the animals’ medical needs and helps provide them with the loving care and attention they deserve if we are unable to secure them a permanent foster placement or in the case of ailing animals, fospice care. Your contribution will enable us to keep our promise to all the animals that they will always have a special place to be loved, cherished, and receive proper medical care for the rest of their days. Ready to make a difference and save lives? Click Buy Now to help senior animals who have been surrendered to our shelter. 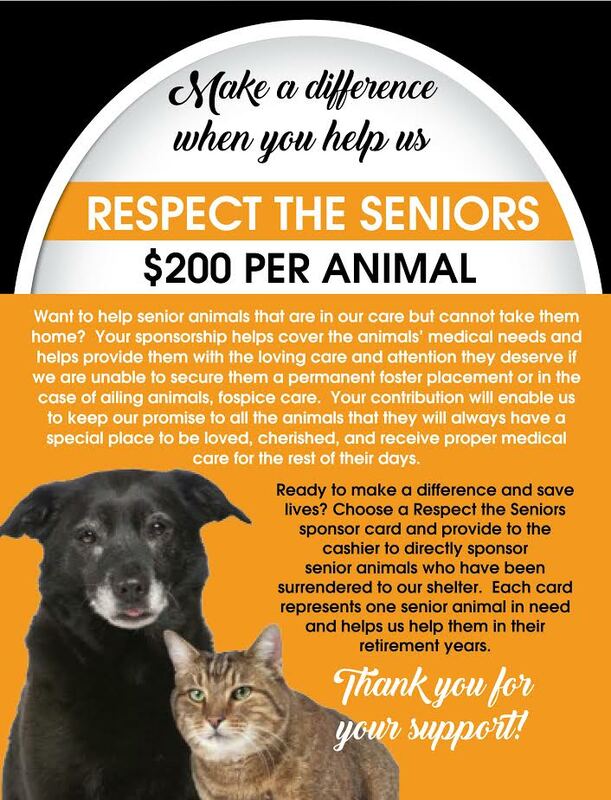 Each purchase represents one senior animal in need and helps us help them in their retirement years. 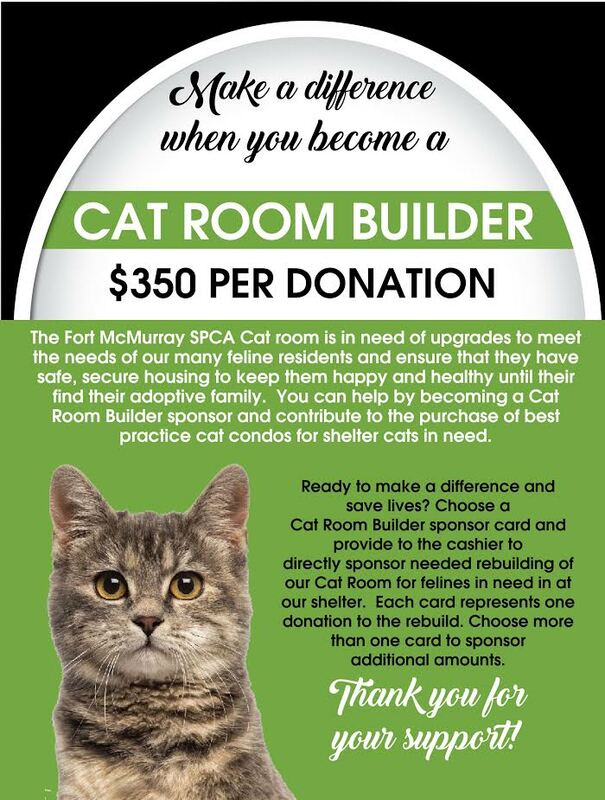 The Fort McMurray SPCA Cat room is in need of upgrades to meet the needs of our many feline residents and ensure that they have safe, secure housing to keep them happy and healthy until they find their adoptive family. You can help by becoming a Cat Room Builder sponsor and contribute to the purchase of best practice cat condos for shelter cats in need. Ready to make a difference and save lives? Click Buy Now to purchase your sponsorship in the needed rebuilding of our Cat Room for felines in need in at our shelter. Each purchase represents one donation to the rebuild. Choose more than one to sponsor additional amounts. Just like humans, dogs are generally much healthier when getting enough exercise daily. There’s the obvious benefit of preventing obesity; which could lead to a string of health issues as well as all of the behavioural benefits we are able to offer shelter pets who are then able to spend less time confined indoors making them more socially adjusted and attractive for adoption. 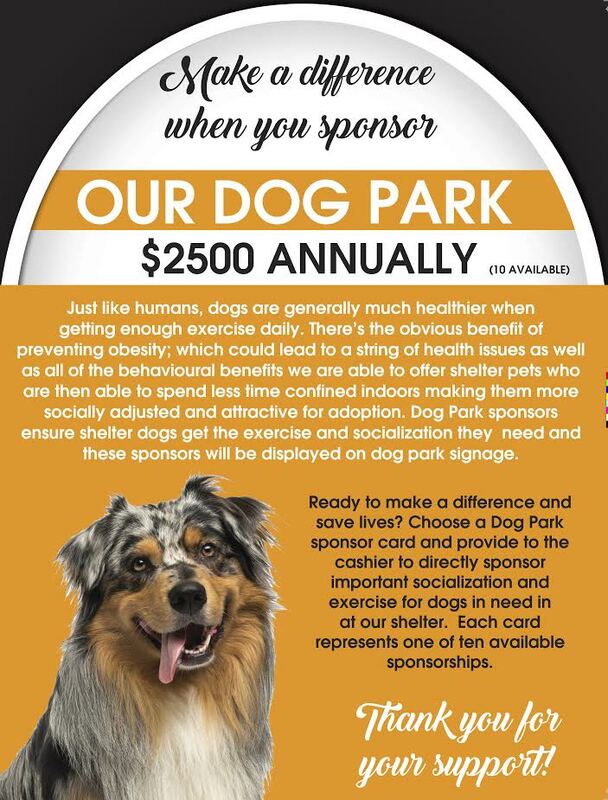 Dog Park sponsors ensure shelter dogs get the exercise and socialization they need and these sponsors will be displayed on dog park signage. Ready to make a difference and save lives? Click Buy Now to directly sponsor important socialization and exercise for dogs in need in at our shelter. Each purchase represents one of ten available sponsorships.